This article is about the American Revolutionary War general. For other people with a similar name, see Nathaniel Greene (disambiguation). Mulberry Grove Plantation, Chatham County, Georgia, U.S.
Johnson Square, Savannah, Georgia, U.S.
Nathanael Greene (August 7 [ O.S. 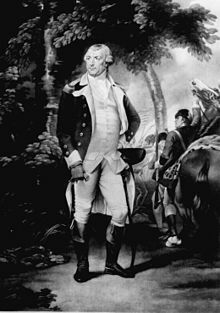 July 27] 1742 – June 19, 1786, sometimes misspelled Nathaniel) was a major general of the Continental Army in the American Revolutionary War. He emerged from the war with a reputation as General George Washington's most gifted and dependable officer, and is known for his successful command in the southern theater of the war. Born into a prosperous Quaker family in Warwick, Rhode Island, Greene became active in the resistance to British revenue policies in the early 1770s and helped establish the Kentish Guards, a state militia. 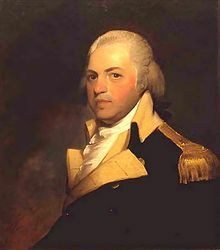 After the April 1775 Battles of Lexington and Concord, the legislature of Rhode Island established an army and appointed Greene to command it. Later in the year, Greene became a general in the newly-established Continental Army. 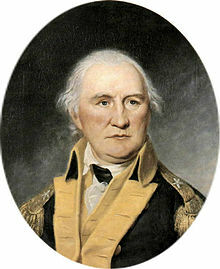 Greene served under Washington in the Boston campaign, the New York and New Jersey campaign, and the Philadelphia campaign before being appointed quartermaster general of the Continental Army in 1778. In October 1780, General Washington appointed Greene as the commander of the Continental Army in the southern theater. After taking command, Greene engaged in a successful campaign of guerrilla warfare against the numerically superior force of General Charles Cornwallis. He inflicted heavy losses on British forces at Battle of Guilford Court House, the Battle of Hobkirk's Hill, and the Battle of Eutaw Springs, eroding British control of the Southern United States. Major fighting on land came to an end following the surrender of Cornwallis at the Battle of Yorktown in October 1781, but Greene continued to serve in the Continental Army until late 1783. After the war, he sought to become a successful planter in the South, but died in 1786 at his Mulberry Grove Plantation in Chatham County, Georgia. Many places in the United States are named after Greene. A 1936 stamp depicting Washington and Nathanael Greene. Daniel Morgan, one of Greene's top commanders, led the Continental Army to victory at the Battle of Cowpens. Henry "Light-Horse Harry" Lee commanded the Continental cavalry under Greene. His statue, along with that of Roger Williams, represents the state of Rhode Island in the National Statuary Hall Collection in the United States Capitol. Washington, D.C. also hosts a bronze equestrian statue of Greene in Stanton Park. A large oil portrait of Nathanael Greene hangs in the State Room in the Rhode Island State House, and a statue stands outside the building's south facade. A cenotaph to him stands in the Old Forge Burial Ground in Warwick. Greene is also memorialized by statues in or near Philadelphia, Valley Forge National Historical Park, Greensboro,  Savannah, Georgia, Greensburg, Pennsylvania, and Greenville, South Carolina. Numerous places and things have been named after Greene across in the United States. Fourteen counties are named for Greene, the most populous of which is Greene County, Missouri. Municipalities named for Greene include Greensboro, North Carolina, Greensboro, Pennsylvania, Greenville, North Carolina, and Greenville, South Carolina. Other things named for Greene include the Green River in Kentucky, Fort Greene Park in Brooklyn, and several schools. Several ships have been named for Greene, including the USRC General Green, the USS General Greene, the USS Nathanael Greene, and the USAV MGen Nathanael Greene. The Nathanael Greene Homestead in Coventry, Rhode Island, features Spell Hall which was General Greene's home built in 1774. ^ Austin, John Osborne (1887). Genealogical Dictionary of Rhode Island. pp. 88, 302, 344. ISBN 978-0-8063-0006-1. ^ Siry, Steven E. (2006). Greene : Revolutionary General. Lincoln: University of Nebraska Press. p. 86. ISBN 9781574889123. Retrieved November 4, 2016. ^ Rappleye, Charles (2010). Robert Morris: Financier of the American Revolution. Simon and Schuster. p. 270. ISBN 9781416572862. ^ a b c Ricks, Thomas E. (September 22, 2010). "The most underrated general in American history: Nathaniel Greene?". Foreign Policy. Retrieved December 22, 2018. 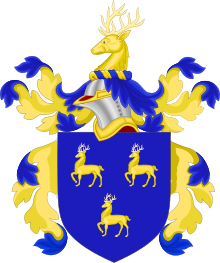 ^ Morgan Jr., Curtis F. "Nathanael Greene". George Washington's Mount Vernon. Retrieved December 22, 2018. ^ Statue of Nathanael Greene in Downtown Greensboro. Greensboro Daily Photo (February 19, 2009). Retrieved on July 23, 2013. Babits, Lawrence E.; Howard, Joshua B. (2009). Long, Obstinate, and Bloody: The Battle of Guilford Courthouse. University of North Carolina Press. ISBN 9780807887677. Buchanan, John (1999). The Road to Guilford Courthouse: The American Revolution in the Carolinas. John Wiley & Sons, Incorporated. ISBN 9781620456026. Carbone, Gerald M. (2008). Nathanael Greene: A Biography of the American Revolution. Palgrave Macmillan. ISBN 978-0230602717. Chisholm, Hugh, ed. (1911). "Greene, Nathanael" . Encyclopædia Britannica (11th ed.). Cambridge University Press. Greene, George W. The Life of Nathanael Greene, Major-General in the Army of the Revolution. 3 vols. New York: Putnam, 1867–1871. Reprinted Freeport, NY: Books for Libraries Press, 1972. ISBN 0-8369-6910-3. Golway, Terry (2005). 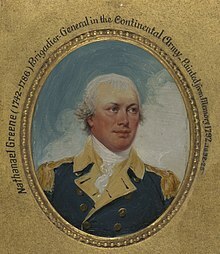 Washington's General: Nathanael Greene and the Triumph of the American Revolution. Henry Holt and Company, LLC. ISBN 0-8050-7066-4. Haw, James (2008). "Every Thing Here Depends upon Opinion: Nathanael Greene and Public Support in the Southern Campaigns of the American Revolution". South Carolina Historical Magazine. 109 (3): 212–231. JSTOR 40646853. Massey, Gregory D.; Piecuch, Jim, eds. (2012). General Nathanael Greene and the American Revolution in the South. University of South Carolina Press. ISBN 978-1611170696. McCullough, David (2005). 1776. Simon and Schuster. ISBN 9780743226714. Middlekauff, Robert (2005). The Glorious Cause: the American Revolution, 1763–1789. Oxford University Press. ISBN 978-0195162479. Oller, John (2016). The Swamp Fox: How Francis Marion Saved the American Revolution. Da Capo Press. ISBN 978-0-306-82457-9. Philbrick, Nathaniel (2018). 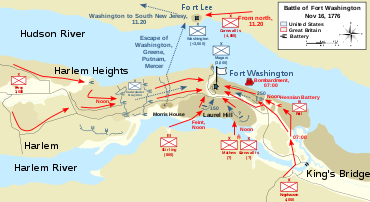 In the Hurricane's Eye: The Genius of George Washington and the Victory at Yorktown. Viking. ISBN 978-0525426769. Siry, Steven E. (2006). Greene: Revolutionary General. University of Nebraska Press. ISBN 9781574889123. Stegeman, John F. (1985) . Caty: A Biography of Catharine Littlefield Greene. University of Georgia Press. ISBN 9780820307923. Thane, Elswyth (1972). 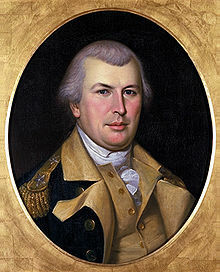 The Fighting Quaker: Nathanael Greene. Hawthorn Books. ISBN 978-0884119715. Vol. III: October 18, 1778 to May 10, 1779. ISBN 0-8078-1557-8. Vol. IV: May 11, 1779 to October 31, 1779. ISBN 0-8078-1668-X. Vol. V: November 1, 1779 to May 31, 1780. ISBN 0-8078-1817-8. Vol. VI: June 1, 1780 to December 25, 1780. ISBN 0-8078-1993-X. Vol. VII: December 26, 1780 to March 29, 1781. ISBN 0-8078-2094-6. Vol. VIII: March 30, 1781 to July 10, 1781. ISBN 0-8078-2212-4. Vol. IX: July 11, 1781 to December 2, 1781. ISBN 0-8078-2310-4. Vol. X: December 3, 1781 to April 6, 1782. ISBN 0-8078-2419-4. Vol. XI: April 7, 1782 to September 30, 1782. ISBN 0-8078-2551-4. Vol. XII: 1 October 1782 to May 21, 1783. ISBN 0-8078-2713-4. Vol. XIII: May 22, 1783 to June 13, 1786. ISBN 0-8078-2943-9.